Have you ever quaked at the thought of reading business blog content? You know you must ingest such juicy knowledge, but you love books too. You need something that puts all Best Google SEO Helper’s wisdom into a format for you. A format you can take with you on the Kindle. A format you can share like a Kindle ebook file. A format that helps you break free from fear and hustle to success. This is an amazing feat of knowledge because we have never done this before and we may never do it again. It is known that Best Google SEO Helper is the only marketing tool that promises strong Klout and good RT. But this innovative company also loves people! We created an ebook that meets you where you are: with recaps and part 2 reminders for slower learners. No marketer is left behind. – Because this is not the average free ebook in any sense of the word. 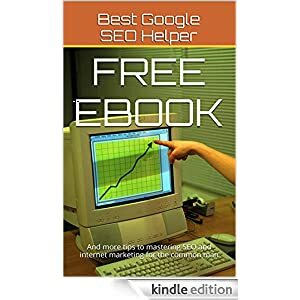 You find more in this free ebook about strong Klout and good RT than any other free ebook available in the Kindle Store. You will never believe it! – Because it has been proven that people are drawn to the word “Free.” People love things that are called “Free.” Nobody knows why yet but this is true science of conversion-based marketing. – As experienced marketers, we understand that all headlines must be point-first. No matter what. Always put the most appealing part of a headline first. “Free” is the most appealing word in the English language, and so it had to go first. Also headlines must be descriptive, and this is an ebook. “Free ebook” is a scientific name for this.